I recently listened to a lecture by Mark Driscoll from 2011 to the students of New Saint Andrews College. This teaching blew my mind and heart in many regards. It was the most heart-opening teaching on the Prodigal Son that I have ever heard. Truthfully, this is now the 4th time I have listened to the lecture. I wanted the words to be emblazoned in my mind and heart, so I typed notes from the lecture for this blog post. I definitely want to encourage you to watch it, as the video teaching is much more dynamic than my text notes. The ultimate goal is not learning more … but for heart transformation so we can glorify God and more people can come to know his saving Grace through Christ… because of Him changing us. The life of a Christian is one of repentance. This seems to be resonating in my mind like a distant gong. Religious Christians counter the sin of religion by intentionally seeking relationships with lost people. I desperately need to get out of my bubble. Don’t listen / read teaching for information… but do it for transformation. Don’t listen to / read teaching thinking “This is great for someone else to hear”… instead open yourself for edification, and focus on others next. Sometimes the truth of God’s worth that we are MOST familiar with that we become the LEAST familiar with. Which is your tendency… toward the rebellion or religion? God’s Plan A is always HUMILITY. God’s Plan B is always HUMILIATION. If you don’t take Plan A, you get to enjoy Plan B. All of a Christian’s life is one of repentance. It is the hallmark of someone growing in the grace of and is a child of God. There are occasions where we turn our back on God and venture toward rebellion… and we are convicted by: the Holy Spirit, our God-given conscious, the Word of God, and perhaps the people of God. Then we turn from sin by the power of the Holy Spirit and grace of God… and have a renewed mind and heart, and set our face toward’s God. Sin is about MORE than breaking a law. It is breaking the Father’s heart. We don’t sin against a legal code, we sin against a loving Father. Change – Decide, in the grace of God and with the power of the Holy Spirit, to change and move back toward God. Many Christian Dad’s have sin of CO-MISSION (willful sin), but of OMISSION (neglecting to do things they should). Dads should be FUN and intentionally invest in / lead their children! They should engage in the lives of their kids. It’s not about just “putting food on the table”! The Father is FUN! Religious people need to grow in the theology of FUN! WE are the ones who have rebelled against, neglected, and fled from our Good Father and wrecked our lives. God the Father is the one who runs to us, accepts us, blesses us, robes us in the righteous of Christ, and that gives the good gifts to NOT just the undeserving, but the ill-deserving. This is grace. Religious people become ANGRY at the Father’s GRACE! They say: “They don’t deserve that! They didn’t earn that! That’s not fair! That’s not right!” That’s right!… IT’S GRACE! Grace is unmerited to the undeserving AND ILL-DESERVING! If you are going to receive grace from the Father… don’t be angry or jealous at the grace the Father gives others. Religious people rarely understand they need to repent of religion / self-righteousness. Both rebellious people and religious people need to repent. The world is not about the rebellious vs. the religious. It is about the repentant and the unrepentant. Religious people think that if they ‘obey the rules’, they earn / deserve something. They make it about THEM, not the Father. That isn’t right. Religious people still need grace. When you see sinners… do you get self-righteously and indignantly angry? Which are you… religious or rebellious? Both have in common: USING the Father. Church strife, conflict, and splits are usually the rebellious and religious fighting against each other. Average non-Christians walk into the church and are confused… they tend to hear “REPENT OF YOUR SIN”… but they think you are saying… “BECOME RELIGIOUS”. 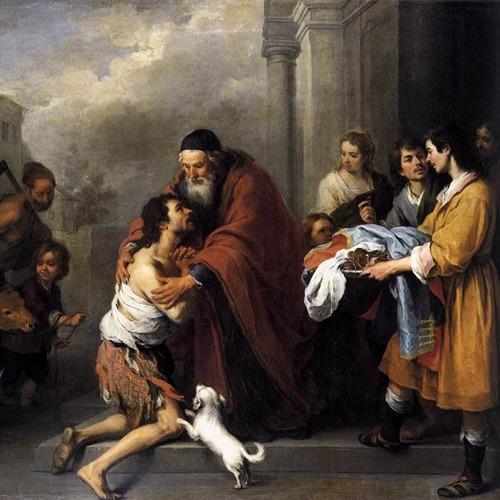 The rebellious and the religious sons in the story of the “Prodigal Story” are BOTH wrong. The right son is the 3rd Son in the story. The 3rd Son is the one telling the story… Jesus Christ. The 3rd Son left his father not for rebellion… but for mission. He wasn’t running from His Father… he was SENT by His Father. Most of Christ’s worst conflicts were with the religious. In scripture, both the rebellious and the religious reject Him. What is your proclivity… rebellion or religion? The BIG IDEA: The Bible is NOT about Good Advice… it is about GOOD NEWS! HERE IS THE BIG IDEA! God does not give good advice… He gives GOOD NEWS! If we come to the Bible seeking good advice, then we tell people to do this and not do that… That’s how we make them religious! Religion is the result of going to the Bible for good advice. We don’t go to the Bible for good advice. We go to the Bible for Good News! The Good News is that Jesus has lived the life none of us could live… that he has died the death that we all deserve to die, and he has risen to give the Father’s GIFT of GRACE! He came to give out the gift of salvation, new life, regeneration, new passions, new pleasures, new desires, new appetites, new mind, and a new identity. For those that repent of their rebellion and religion, they are given a seat at the Father’s banquet table of joy, his throne. They get to get objects of the father’s affection. Which do you lean toward… rebellion or religion? The answer for both rebellious son and the religious son is the REDEEMING SON! [Addressing students at a Christian college] The tendency of students is RELIGIOUS. You can live under the Father’s gracious provision so long that you cease to believe you need it any more… and that is when religious begins. How do we enter into the Father’s party [of Grace] when we are in a rich Christian environment? When you live in a sea of rebellion… it CAN push you toward religion. If you grew up in Christian homes… you are a miracle. For most of the world, that just isn’t the case. [If you are in a Christian bubble that tends toward religion] … you need to spend time with lost people. Lost people aren’t STUPID… they are LOST! You can be smart and lost. You can start dealing with caricatures or categories of people instead of people with names and faces… that is bad. Once you meet and get to know a lost person, you realize the difference the Father makes. This causes you to have the Father’s heart, which is one of COMPASSION. Compassion says “Apart from the Father’s love, I was or can be just like you”. Condemnation says “You are worse than me, I would never do that”. It is great, glorious, and good to enjoy the fellowship of the saints (aka: Christian bubble)… but you need to work hard at growing in deep relationship with a few close friends who don’t know the Father so you have appropriate compassion. When you about the Father’s love, people are changed. The Holy Spirit changes people, rebellious and religion. How do you distinguish between reading the Bible for advice vs. reading for growing in loving God / your neighbor. I’m not against wisdom. If we are choosing between wisdom and folly, I choose wisdom. The way the Bible can be misread: It’s a whole bunch of stories that have good advice. For example: David fought a giant… FIGHT YOUR GIANTS!… Is depression your Giant?… Find some rocks. You can get this on Oprah. This is moralizing the Bible, and is wrong. When you really read the Bible, you see the people that seem like the “heroes” are actually the villains. For example: How many times did Abraham give his WIFE to another man? TWICE! Once is a lot! It is one too many! The heroes are only righteous men by the Father’s grace! The appropriate way to read the Bible is as ONE single story, with a lot of sub-plots. It is a bunch of villains and one savior. Every sub-plot is connected to the big story of Jesus. Read the Bible as one story… not in a moralizing way where you are trying to get good advice… but read it in a saving way where you are hearing Good News… a Savior has come for someone like me. Because of rebellion or religion, either way I am far from the Father, and I don’t love him… so I need the redeeming son to come and get me and save me from my Satan, sin, death, hell, and wrath of God. YES! I need God to save me from myself. Good advice leads to “all these principles for how to be a winner”… so you think you are a winner… then you are religious! Pride = I DID IT! Despair = I can’t do it. With both of these, there’s never the joy and reality of your salvation through the redeeming love of Jesus. How do we grow in the grace of fun? [An analogy from Doug Wilson] In Genesis, when God created the garden and the earth… it was a grace garden and a law tree. He did NOT say, the whole world is off-limits and there is a lollipop tree in the middle. God said, the whole Earth is yours… there is one tree I say no. Christian homes should be like that. Kids who rebel the hardest often come from the most religious homes. If you make fun of religious people and make fun of their religion… they don’t laugh! If you are religious, you can’t have fun. There might be a THEOLOGY of grace, but there’s not an ENVIRONMENT of grace. Kids like to have fun. They like to be silly. Jesus said the Kingdom of GOD is made for ones like children. He is not saying out faith should be CHILDISH, he is saying it should be CHILDLIKE. That is… our Dad is great, we like being with him. If we do something wrong, our Dad corrects us, but Dad’s not always trying to correct us… he is trying to ENJOY us. A father disciplines the children he loves, delights in, and enjoys. The majority of parenting life is to be enjoying your kids, and correcting them as need. That’s how the Father deals with us. When Jesus says “Father”… he is using a personal term, Dad. Jesus says, pray to Dad. When you enjoy God in this way… people are drawn to him in a way that they’re not drawn to religion. At home and in church… does it look like people ENJOY GOD? Other religions don’t use the word “Dad”… that is a radical word! Where is tradition beneficial to the church? Jesus didn’t talk about religion a lot… and when he did, it wasn’t great. Tradition isn’t necessarily bad, but it can be mechanistic and it can become legalistic. It can be a way of trying to MANAGE a relationship with God as opposed to HAVING a relationship with God. For tradition, it depends on what the tradition is and the motive behind it. There is a big difference between routine and ritual. Routine = Where you just do it because that’s what we do… you do it because that’s what THEY do, you do it because that’s what we’ve always done. Ritual = Yea they did it, yea we do it… and it is because we love the Father. There is a difference in the motive and the heart. You can watch routine and ritual and not necessarily be able to tell the difference between the two. The Holy Spirit empowers ritual. You can’t say that everyone doing the ritual is ritual… for some it may be cold, hard, functional, duty-bound routine and you can’t tell. We should NOT look at other people and guess if their actions are routine or ritual. We are to look at ourselves and see where our hearts, motives, and focuses are. Religion happens when everyone is OK if everything LOOKS PIOUS, but we know that God judges and sees the heart. The difference is the Holy Spirit. A unregenerate person can through religious traditions that are routines… similarly, somehow who is regenerated by God and filled with the Holy Spirit can do the exact same thing and for them is it life-giving ritual… it is a sacred thing. Then it isn’t tradition… it is worship. 17 “But when he came to himself, he said, ‘How many of my father’s hired servants have more than enough bread, but I perish here with hunger! 18 I will arise and go to my father, and I will say to him, “Father, I have sinned against heaven and before you. 19 I am no longer worthy to be called your son. Treat me as one of your hired servants.”’ 20 And he arose and came to his father. But while he was still a long way off, his father saw him and felt compassion, and ran and embraced him and kissed him. 21 And the son said to him, ‘Father, I have sinned against heaven and before you. I am no longer worthy to be called your son.’22 But the father said to his servants, ‘Bring quickly the best robe, and put it on him, and put a ring on his hand, and shoes on his feet. 23 And bring the fattened calf and kill it, and let us eat and celebrate. 24 For this my son was dead, and is alive again; he was lost, and is found.’ And they began to celebrate.